Alex did a great job standing in for our President, ensuring everyone felt welcome. He explained that Toastmasters is not just about learning to speak to an audience but also about being able to articulate your thoughts. Mohammad our Timekeeper gave us a quote from William Penn, “Time is what we want most but what we use worst2 and asked, ‘If time is money, are ATM’s time machines?’ He kept us all to time. Matthew, our Grammarian promised to listen zealously to everything said and returned later with his impressive report. 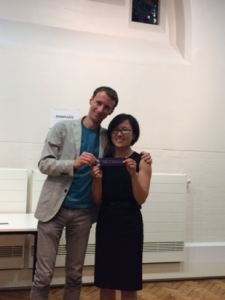 Yumi, started the evening’s speeches with her Ice Breaker, the very first speech in the Toastmasters Manual. She told us about growing up in in Japan and learning English to help her communicate with more people around the world. Jasmine is working her way through the manual for a second time which is a great way of developing speaking skills. She told us about her experiences of travelling the world by couch surfing, a great way of making friends. Our third speaker, Fahad is an advanced speaker and started the Communicating on Video manual this evening. This is a different type of speech, delivered to camera instead of an audience. It is quite challenging with an audience still in the room but Fahad did an excellent job of presenting an episode of ‘Moment of Truth’ with Cleo as camera woman. We had three evaluators, Andrew, Ed and Diane who provided some useful commendations and recommendation on the speeches. Commendations included great use of humour, pauses and audience participation by using questions. Recommendations included suggesting a more relaxed stance, expanding a topic to enable the use of more descriptive language and using vocal variety. This evening we had 13 guests who were all invited to introduce themselves and we look forward to seeing them again. 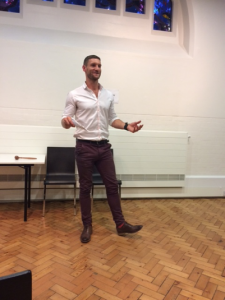 Guests are always welcome to visit our meetings to find out more about Toastmasters. Next was our table topics section, led by our Table Topics Master, Thomas. He asked us to tell a story, which developed in to Donald Trump in a thong, buried treasure and the Queen being upset about the damage to her lawn. Helena our Harkmaster, challenged us with some questions to see how well we had been listening. As ever Fahad, had been listening well and won a few chocolates! Everyone who speaks gets evaluated to help them improve. Our General Evaluator for the evening Lynne gave us all some useful recommendations, including scanning the audience with your eyes in an X or Y motion ensure everyone feels included when speaking. Our Toastmaster Andy led us expertly through the evening and was complimented on his voice. We concluded our meeting and popped next door for a social drink.